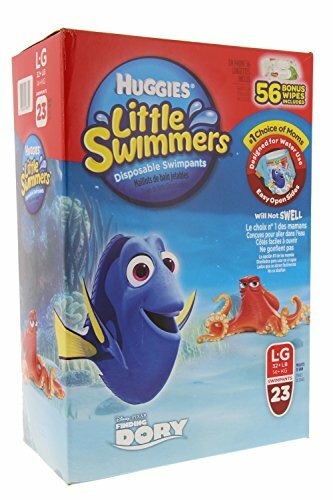 Designed for pools, beach and backyard water play, Huggies Little Swimmers Disposable Swimpants are uniquely made with absorbent material that will not swell in water, leaving your swimmer to focus on fun. Featuring extra-protective leak guards, messes are contained. Little Swimmers have easy open, recloseable sides for diaper changes and quick adjustments. It also has stretchy, soft sides that help keep your little one comfortable. Featuring Disney Pixar Finding Dory designs, your swimmer will make a fun fashion statement.